Are you considering buying bulk wedding flowers and creating your own wedding arrangements? There are many places you can order, such a floral shops (yes, many will sell straight flowers! ), super store chains, regular retail grocery stores and even floral wholesalers who are also open to the public (at better than regular retail pricing, but not as good as wholesale pricing, of course). Costco has been a popular choice with many brides in the super store environment. You are able to see photos, pricing and stem counts on Costco’s website. Be sure to compare prices and check out the terms. Many of these places need your order well in advance, so be prepared. Also, if you do decide to order bulk flowers you will want to choose what types of flowers you want ahead of time. Some flowers are easier for the DIY Bride to work with than others. Good choices for bulk wedding flowers are roses, spray roses, mini callas, carnations, spray carnations, hydrangea, orchids, various mums, sunflowers (both the large and small are fairly sturdy), delphinium and stock. Consider your color preferences as well, as all flowers do not come in every color. For example, do not expect to be able to order a natural blue mini calla, but instead consider blue hydrangea and delphinium. Some flowers might spell disaster for the untrained floral participant. 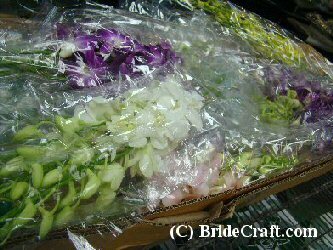 When considering ordering bulk wedding flowers, keep in mind how busy you will be the week of the wedding. You do not want to have to baby difficult-to-work-with flowers. Certain flowers can take a long time to open, or may even need to be opened manually. Most fresh lilies can take days to open, and then can stain clothing and fingers with their strong orange/yellow pollen, for example. If you feel confident enough with your creative skills to try your hand at your own wedding flowers, be sure to make choices that will not add to your stress. Still crazy about a high maintenance bloom? Consider having a pro florist handle a flower you do not feel confident with. And if they are just not within your budget, start getting to know your chosen flower months in advance. 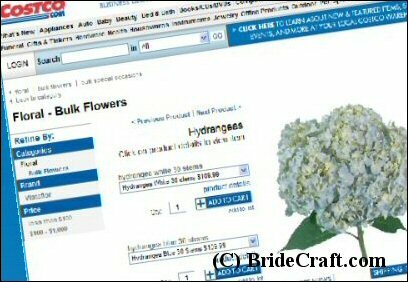 When you order bulk wedding flowers, most of the time you will need to order a certain quantity. For example, in most cases you will not be able to order just a dozen white roses. Why, you wonder? 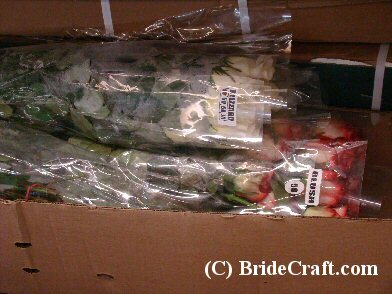 Because bulk roses are packed and sold in 25 stem bunches. So you would need to order the minimum of at least 1 bunch of 25 stems. Also, consider how long you need the stems of your flowers to be. Many flowers, such as the popular rose, are sold by the centimeter. A shorter rose will be cheaper than a longer stemmed one. Research bulk floral providers in your area to see if they are able to obtain the types of flowers you are interested in, how they come packed (how many stems to a bunch), how much notice they need for your order to be placed and how much your items would cost. Flowers are seasonal, so keep in mind that prices fluctuate, and ask for an estimated price range for your chosen wedding date. 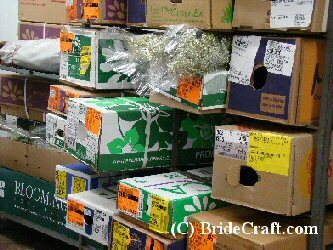 Also keep in mind that when you arrive to pick up your order, the flowers will most likely be handed over directly from the dry storage cooler. This means that the flowers will be cold, dry and boxed. You will need to take them directly home, cut about an inch off the bottoms of the stems, and place them in cool water so they can begin to hydrate. Take everything in to consideration, and decide if ordering bulk flowers is a good option for you and your wedding. Bulk wedding flowers can save you a bundle, and putting them together yourself will help you save even more. Do-it-yourself wedding flowers can be a way to express your own creativity, have a beautiful wedding, AND save money!